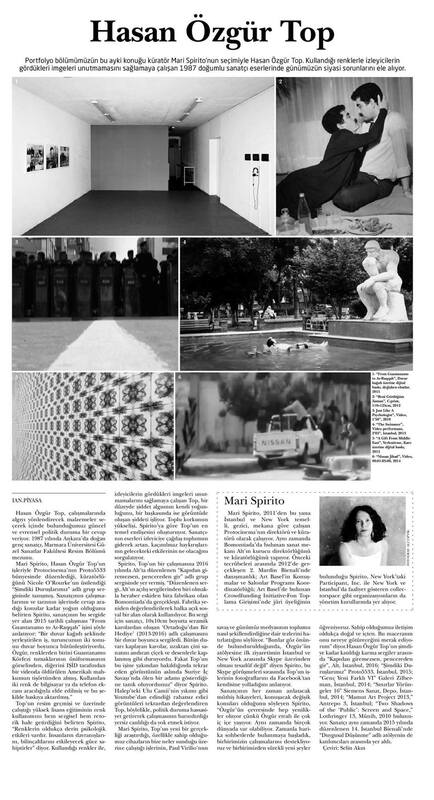 In our Portfolios section this month, we have Hasan Özgür Top as a guest exclusively selected by curator Mari Spirito. Born in 1987, the artist with his peculiar color use addresses to current political issues in his works, trying to make sure the audience do not forget the images they see. Hasan Özgür Top in his works is giving an answer to the current and universal political situation that we are in by choosing materials that would steer the perception. Born in 1987 in Ankara, the young artist was graduated from Marmara University Faculty of Fine Arts, Painting Department. Mari Spirito meets up with Hasan Özgür Top’s pieces of artwork at the group exhibition entitled “The Ways We Stand By,” organized by Protocinema in collaboration with Proto5533 and curated by Nicole O’Rourke. Expressing also that Top’s background of painting and post-graduate studies ongoing have made his color use both intuitive and rhetoric, Spirito states “Colors have strongly deep psychological effects. They have the power to influence people’s behaviors and subconsciousness.” With his peculiar color use trying to make sure the audience do not forget the images they see, Top at one level works on the very intensity of the sense of violence, and the violence that emerges in the image itself at the other. According to Spirito, the rise of public horror is the matter of Top’s most basic concern. The artist’s works make the audience question what the future effects of the increasing and inevitable outcries of contemporary society will be. Spirito puts one of Top’s works on display in a group exhibition entitled “If You Can’t Go Through the Door, Go Through the Window” that was organized in Alt in 2016. “The exhibition, as well as being one of Alt’s opening exhibitions, was held at Bomontiada which used to stand as a former brewery. The factory is being re-evaluated and used as a public social space now. For this exhibition, the artist displayed his artwork ‘A Gift from the Middle East’ (2013-2016) made up of 10x10cm ceramic tiles along a wall. The tiles covering the whole wall seemed to have prints of flowers and patterns on reminiscent of a ceramic art from a distance. But when taken a closer look at Top’s work, what you actually witness was the recurring image of a man who died in the Syrian Civil War,” says Spirito. Reconceiving some disturbing images he got from Youtube such as the destruction of the Great Mosque in Aleppo, Top thus wants to eliminate the digressive vitality of his works too by providing sensitivity to the political situation. Mari Spirito remarks that Top’s works, where he researches a new reality and especially deals with what those devices we have really offer us, remind us of Paul Virilio’s thesis on how the war and the contemporary media have shaped the society. Remarking also “When considered all these, it is not a coincidence my first visit to Özgür’s workshop was on Skype between Istanbul and New York,” Spirito expresses that during those Skype interviews Top also sent her some photos of his works on Facebook. Stating about the artist that he anytime has great stories to tell, various topics to talk about, Spirito expresses “There is always something different happening around Özgür because he lives very much together with his surroundings. He is also able to exist in various worlds. Over time we began to engage in great conversations with him, we support each other’s works and we constantly learn new things from each other. The communication we have is quite natural and sincere. I wonder where this adventure will take him.” Among the group exhibitions he has participated so far there includes “If You Can’t Go Through the Door, Go Through the Window,” Alt, Istanbul, 2016; “The Ways We Stand By,” Proto5533, Istanbul, 2015; “Young Fresh Different VI,” Zilberman Gallery, Istanbul, 2014; “Borders Orbits 16,” Siemens Art, Depo, Istanbul, 2014; “Mamut Art Project 2013,” Antrepo No: 3, Istanbul; “Two Shadows of the ‘Public’: Screen and Space,” Lothringer 13, Munich, 2010. The artist also participated in the workshop entitled “Emotional Thinking” at the 14th Istanbul Biennial held in 2015. Mari Spirito is the director and curator of Protocinema that is Istanbul and New York based, travelling and working site-aware since 2011. She is also the founding director and curator of Alt that is an art space centered in Bomontiada. Apart from her prior works as an advisor in the 2nd Mardin Biennial held in 2012, as a program coordinator in the “Art Basel’s Conversation and Salons” and as a juror in the Crowdfunding Initiative in collaboration with Art Basel, Spirito is also on board of directors in the organizations such as Participant Inc (New York) and Collectorspace (New York and Istanbul).